Millions of super rats are predicted to populate Britain, as they are building immunity to over-the-counter rat poisons. Bird-X Inc., leading brand in humane pest control solutions, addresses a new blog clarifying the event. "...the toxic rat pellets that are commonly used to eradicate the pests are not only ineffective, but resulting in bigger and stronger rodents." Bird-X’s recent blog published on February 1st, 2016, clarifies the two main factors that make up a ‘super rat’ – the ability to grow up to 2 feet long while remaining fully resistant to off-the-shelf poisons. 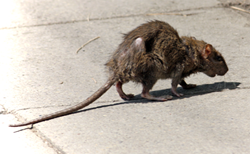 As Mirror Online states, the toxic rat pellets that are commonly used to eradicate the pests are not only ineffective, but resulting in bigger and stronger rodents. The growing immunity of these giant rats is only one of many components that contribute to the predicted plague. The warm winter weather and lack of snowfall has had its effects as well—allowing for abundant natural food sources to be available for rats, and establishing the perfect environment for breeding. Rat behavior adds to the mix as these rodents scavenge for food in a smart manner. Taking a small bite of something first, they wait to see its effects on their body before continuing to eat. Bird-X understands the dangers and mess that come along with using poisons and traps. As an international pest control provider, Bird-X focuses on producing products that are eco-friendly and humane while still remaining efficient. Humane methods not only eliminate clean up and cruelty, but they utilize behavior modification to encourage pests to seek alternative, untreated areas.